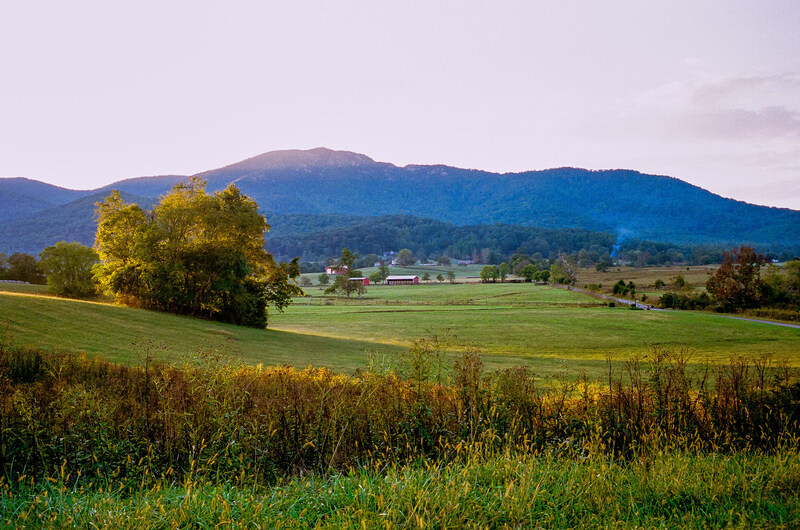 If you’ve spent any time exploring Virginia Wine Country, it’s likely you’ve met Madison County, maybe without even realizing it: her farmlands fall on either side of Route 29, the road between Charlottesville and Northern Virginia and her western flank edges up the slopes of Shenandoah National Park. The county’s five wineries are as different as the wines they craft, and each tells a unique story, from the quest of a billionaire owner committed to shining a light on the state’s vinicultural stars to the earnest eco-practices of one of Virginia’s tiniest wineries. This casual, three-day retreat is built around Madison’s wineries, though any traveler with a taste for backroad exploration will find plenty here to like. Wear your sneakers, but toss the stilettos in the back, just in case. Arrive mid-day and check in at the Madison County Visitor’s Center (110 N. Main Street, Madison) for maps and breaking news, then make a beeline for a made-from-scratch lunch at the Café at Yoder’s Country Market, which is owned by a very industrious family from the local Mennonite community. Pick up some baked goods – maybe a few hand-held fry pies, shoofly pie, or German chocolate cupcakes – to snack on later or to stash for breakfast tomorrow morning. Picnic outside at the tables hewn by Amish and Mennonite craftsmen (available for purchase), then take a stroll through the petting zoo, which gives you peeks at everything from alpaca to exotic fowl to potbellied pigs. Take Rt. 29 North to “downtown” Madison and stroll the shops on Main Street like SheShe, an upscale consignment shop, and Market on Main in the old Post Office building. Under one roof you’ll find a bakery, crafts, consignments and even a spa for facials and more. Just outside of town, be sure to stop in at E.A. Clore Sons, Inc. The showroom features handcrafted early American furniture that is prized up and down the east coast. Head back to Rt. 29 North to reach Prince Michel Vineyards and Winery. One of Virginia’s oldest and largest wineries, with a production of around 50,000 cases annually, Prince Michel was founded by a French couple in 1982 and the wines have been made by Brad Hanson for 19 years. Brad’s longstanding relationships with vineyard owners throughout the state guarantee that Prince Michel has access to some of the best fruit around. In fact, Brad’s wines have been awarded 400+ medals in competition. Prince Michel sells three lines of wines: Prince Michel, with high-end craft wines like Viognier, Cabernet Franc, and meritage blends; Rapidan River, for more casual drinking; and Carter Mountain, from the esteemed area of the same name in the Monticello AVA. 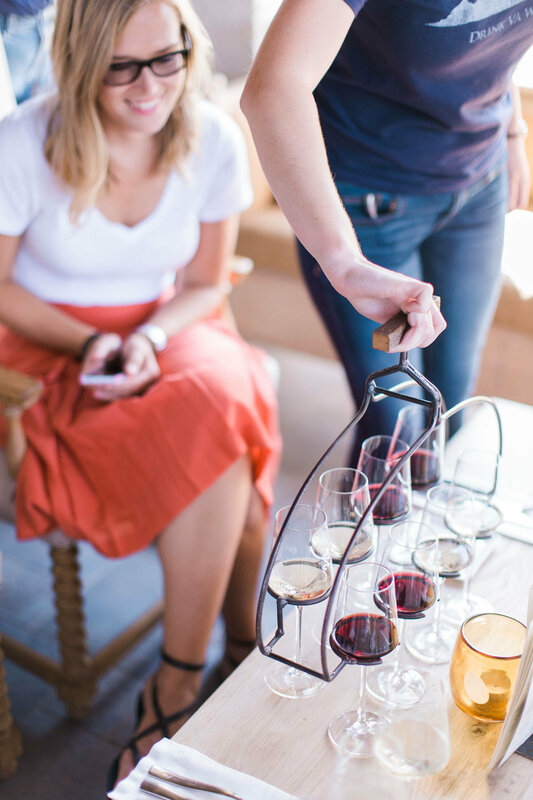 The big oval bar in the tasting room can handle dozens of visitors – fun for people-watching – and a huge array of wine merchandise ranging from kitschy to clever helps fill those waiting-for-the-next-pour moments. After your tasting, take a self-guided tour along the catwalk overlooking the wine production area below, where all the magic happens. Or call ahead to arrange for a personal guided tour or private barrel tasting. There are numerous B&Bs, cabins, and lodges scattered throughout Madison. But for this wine weekend, check in to one of Prince Michel’s luxurious Suites located amid vineyards behind the winery. Decorated in French Provincial style, each has its own fireplace, kitchen, and private patio with mountain views. For dinner, a 15-minute drive brings you to Elim at the Inn at Meander Plantation for a truly special meal. The prix-fixe 4-course menu can contain such delicious offerings as quail, duck, trout, venison, pork or seafood, complemented by a flight of four Virginia wines. Seating is at 7:00, sharp. Today you’ll discover Madison County’s great outdoors. Take your pick: Fishing or horseback riding will fill your morning. At Douglas Dear’s Rose River Farm, Dear has recreated an experience similar to what he found enticing about Colorado and Montana – trophy trout fly fishing in quiet, pristine surroundings. Tip: For full immersion, book a yurt-style cabin on the property next time you visit. If you opt for horseback riding, head to the stables at Graves Mountain Lodge, where you can ride for as little as an hour or as long as six. The gentle horses wind their way through fields, orchards and woodlands. Cross streams enjoy the flora and fauna and notice the quiet. For a traditional down-home lunch at an old-fashioned price, Graves Mountain Lodge serves family-style all-you-can-eat country ham, catfish, prime rib, fried chicken or rainbow trout, depending on the day. ($12.95/person; half price for kids under 17.) A full buffet is served for Saturday dinner or lunch and dinner on Sundays. After dinner, $5 buys you a hay ride and marshmallow roast on Fridays and Saturdays. After all the physical activity, relax at DuCard Vineyards. Owner Scott Elliff built one of Virginia’s first solar powered wineries; ask about a vineyard tour to learn about his green initiatives and why DuCard was named Green Winery of the Year. Settle down in the warm wood-toned tasting room or slate patio with a bottle of gold-medal Viognier, Cabernet Franc, Rose, or the more unusual Triskele. The name comes from the ancient Greek describing a blend of three elements, for instance earth, water and fire. DuCard’s version features petit verdot, cabernet franc, and merlot, fusing into rich flavors of blueberry and cherry with hints of violet and sweet spices. On selected dates, DuCard also offers a seated tasting, featuring current releases, premium selections and rare library selections no longer available to the general public, with gourmet food platters to accompany the wines. No reservations are required but check their website for dates. 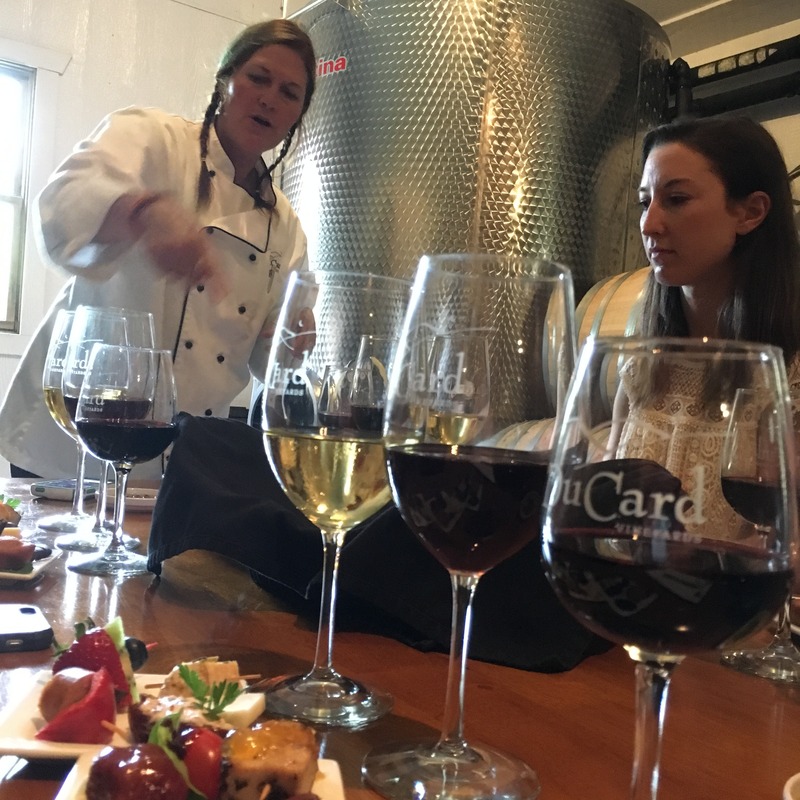 Or round up a group for the winery’s wonderful private Wine & Food Pairing event in the barrel room, led by the winery’s very personable chef; much of the food is grown in her own garden. By advance reservation only. Tip: DuCard’s dedication to all things green is evidenced by their complimentary TESLA electric car charging station. No charge to charge! Great place to take your half-hour+ break. New on the scene is Revalation Vineyard, fifteen minutes away heading back toward Route 29. No, not a mis-spelling, the winery is near the town of Reva, and had its grand opening in March of 2018, with their first vintage harvested in 2014. Owners Julien and Francoise Seillier-Moiseiwitsch have planted viognier and chardonnay and have a pinot gris, vidal blanc and cabernet sauvignon in bottle. Francoise started a viticulture training program at Madison County High School where students have the opportunity to sample Virginia grape juice and verjus. The tin-roofed log cabin that serves as the winery’s tasting room has superb views of the nearby mountains. For dinner, try a local institution. Many of Madison’s early settlers came from Germany, and while not an original settler, son Jerome Thalwitz continues in his parents’ footsteps at the Bavarian Chef. Open since 1974, this traditional German restaurant dishes up the best wiener schnitzel (that’s breaded veal in the style of Vienna, nothing to do with hot dogs), and sausages like bratwurst and weisswurst accompanied by the requisite side of sauerkraut, along with pork, chicken, steak and fish dishes. Servers in traditional deutsche costumes add to the fun. In case you haven’t had your fill of beer with dinner, a visit to Bald Top Brewery to sample an array of artisan beers is in order. Owners Dave and Julie, along with brewer Mike, source materials locally and grow ingredients on their own farm that are used to craft a full spectrum of delicious beers. Open until 10pm on Fridays and Saturdays, the brewery’s Tap Barn began life in the 1940’s as a hay barn, and now features 6-10 seasonal beers on tap. Sleep in late after the satisfying meal last night. But make sure you’ve booked an appointment in advance to visit Brightwood Vineyard and Farm. With the last name Vidal, owners Dean and Susan were destined to get into the wine business. 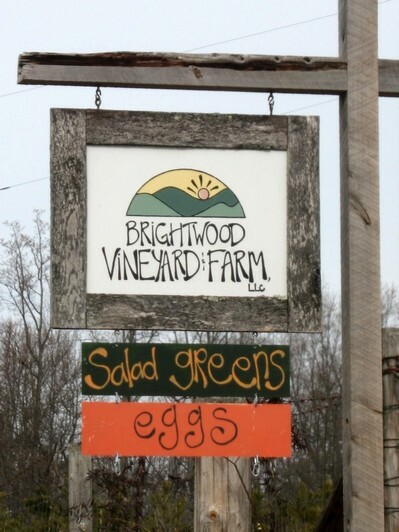 Sample their fun fruit wines – dry elderberry, blackberry, dry pear and peach – and tour the 100-acre organic farm (Brightwood is one of only two organic wineries in Virginia) where jams and jellies, fresh eggs, and vegetables are available to take home. Travel south on Rt.29 and turn right to reach Early Mountain Vineyards. Steve and Jean Case of AOL fame acquired Sweely vineyards some eight years ago, then spent two years renovating, updating, and refining the property. The impressive tasting room boasts a comfortable, rustic sophistication with natural stone and wood detailing that recalls the grand lodges of old. Early Mountain 2015 Eluvium achieved one of the highest honors that can be bestowed on a Virginia wine: it was named to the Governor’s Case in the Governor’s Cup Wine Competition 2018, a place awarded to the top twelve wines of the year. The winery earned a total of five gold medals in that competition: for the 2015 Eluvium and the previous vintage, 2014, as well as 2015 Novum, 2016 Chardonnay and 2015 Quaker Run Chardonnay. When Jean Case made the decision to invest in Virginia wines, she vowed to broadcast the exceptional quality and diversity she believed possible in this emerging region. Early Mountain’s “rising tide floats all boats” commitment is most evident at the tasting bar, where a “Best of Virginia” line-up of pours lets visitors try out carefully vetted wines from excellent vineyards around the state. Make your selection and stay to enjoy live music on the weekend. Early Mountain also does lunch, including a fresh, seasonal menu of small plates such as citrus-cured salmon, charred carrot & beet salad, or marinated olives or heartier fare like sandwiches or pasta paired with a wedge or kale salad. Time permitting, end your Madison County stay by stopping to shop at Plow & Hearth or Southern Grace, on opposite sides of the highway a two-minute drive down Route 29. Merchandise available through Plow & Hearth’s down-homey catalog is displayed at the retail shop at the rear of the property, including quilts, bird feeders, trellises and lawn furniture, garden clogs and much more. The outlet in front is devoted to discontinued and discounted items so you’ll find bargains galore. Southern Grace is known for its display of outdoor water fountains – the largest in the state – and eclectic assortment of home décor and garden pieces. Heading further south, check out MAD Arts (Madison Arts Exchange) with something artsy for everyone – over 200 local artisans show a variety of one of a kind items here. Shopping for whimsical hand carved garden art? Shed Lady Janine, director of the MAD Arts complex, expanded to a second location, M.A. Outdoors and More, to show large size wooden sculptures and yes, garden and tool sheds too.